Gillian Parke’s work explores the fusion of rough and fine textures and surfaces into complete pieces of ceramics. The roughness is embodied in the Japanese aesthetic of wabi-sabi, which finds beauty in the natural imperfections that arise when throwing and firing stoneware; the fineness emanates from traditional western manufactured porcelain ceramics. Feldspar inclusions are added to porcelain and the resulting surfaces are achieved through a combination of an unpredictable atmospheric gas firing and reliable electric firing. 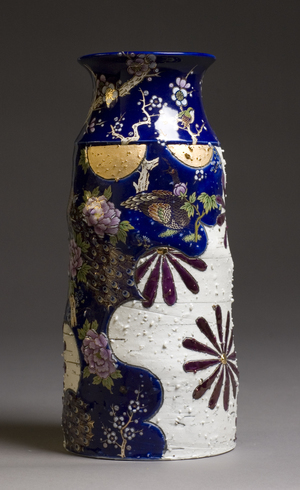 The conflict is further explored by incorporating open-stock decals and metallic lusters, which have often been overlooked by modern studio potters as feminine hobby materials.